Meeting Scientist Dr. Susan Harkema, Ph.D.
“This photo was taken when Mark, Mark’s trainer and friend, South Pole Simon O’Donnell and I travelled to the US to meet a number of scientists who are looking at spinal cord injury recovery. I can’t quite remember now why we are laughing. Dr. Susan Harkema, Ph.D. is incredibly accomplished, bright and focused on her work. I have been reading journal articles about her since Mark broke his back. Then I met her and she is also warm, funny, kind and so, so passionate about giving people like Mark some victories over paralysis. The machine Mark is sitting in measures the torque muscles create. 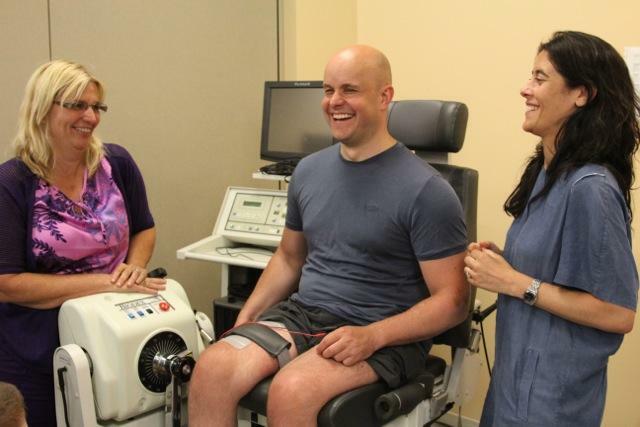 So, if you or I were in the position shown in the first photo we would be asked to kick out our leg and the machine would measure the power in the right quadriceps muscle. Mark cannot kick out, so the pads stuck to Mark’s thigh allow the therapist to electrically stimulate the nerves that make the quadriceps contract, the quad should contract and create some torque and a kick – POW! Christopher Reeve and the doctors and scientists working with him wrote about improvements in his paralysed body as a result of stimulating his muscles to contract. These were the articles that I read over and over when Mark was in hospital in 2010. I also read many of Dr. Harkema’s articles and was able to tell her that for some reason her name had led me to picture her as an Asian gentleman. To be able to work with her now, to even meet her has been a privilege. Dr. Harkema’s Ph.D is in physiology and working through a collaborative partnership in Louisville she is also the National Director of the Reeve Foundation’s NRN, a cooperative network of cutting-edge rehabilitation centers designed to provide therapies by translating scientific advances into activity-based rehabilitation treatments.